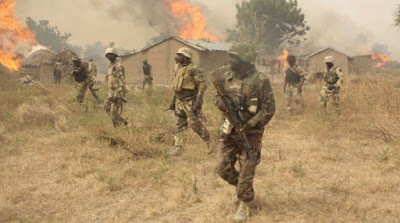 But Defence Headquarters in a reaction, dismissed all the allegations raised by the surviving soldier, insisting that only 23 soldiers were killed in Metele attack. The soldier, who disclosed these, yesterday, to Vanguard on condition of anonymity, said the video being circulated as depicting the Metele attack was the video of an earlier attack on soldiers in Jeli. He further noted that the wrong location of the base, faulty Armoured Personnel Carriers, APCs, and absence of aerial support from the Nigerian Air Force made it possible for the insurgents to inflict heavy casualties on the soldiers. Consequently, he urged the President to review the welfare packages of those fighting the war, alleging they are being underpaid by the authorities. Also, he regretted that the ground troops were not getting enough support from the Air Force, saying while Boko Haram insurgents monitored their activities with drones, the Air Force hardly carry out such tasks in enemy camps. But, some of our commanders failed and were then promoted. It shows that we are very wicked and we have lost it all as a nation. What about the people that died as a result of his actions? “On our welfare, the Federal Government has released Ratio Cash Allowance, RCA, and operational allowance. It has not been given to us. We are only paid N20,000 monthly, and we are not paid at when due. They pay N10,000 in cash and N45,000 is being given to the commandant for feeding. What are we being fed? They feed us beans every day in the morning. At noon we are given rice, while we eat garri for supper. People have developed diabetes because of regular intake of carbohydrate. Some soldiers now have challenges with their eyes because of what we eat. We are not properly fed, but they will come out to tell Nigerians that soldiers are well paid. “The issue is not about deploying more people to the North East. People have stayed in the North East for four years without being rotated. Some have never seen their families, some who had no chance of seeing their families have died. They should forget about sending people to the North East and equip the soldiers properly. I want the President to heed this advice. What we need is not to send people to Sambisa. The President should ask what the army leadership did with money for the procurement of weapons. Did they actually buy new weapons or refurbished weapons? “The APC’s we have cannot run for 10 to 15 minutes without overheating or stopping in the bush. The Anti-Aircraft Artillery, AA, also has the same challenges. We cannot shoot for three minutes without stoppages. But Boko Haram shoots for more than two straight hours without stoppages. Now, the question I am asking is: Is the Army supposed to be on the offensive or defensive? I know that an army is supposed to be on the offensive. There is no need for us to be defensive all the time. Hey Buddy!, I found this information for you: "True Story Of Metele Attacks – Surviving Soldier Reveals What Really Happened". Here is the website link: https://headlinenews365.com/true-story-of-metele-attacks-surviving-soldier-reveals-what-really-happened/. Thank you.